As low as $11.21 per shirt when you buy 576 pieces or more! 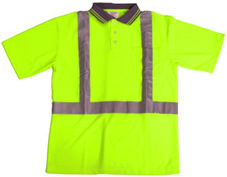 ANSI Class 2 Safety Lime Yellow Green Polo Shirt. 100% polyester breathable fabric. Quick dry. Short sleeves. V-neck with 3 button collar with grey trim. Left chest pocket. 2" wide horizontal and vertical silver reflective stripes on front and back.